LAU’s Facilities Management Department has big development plans for the physical resources on the Beirut and Byblos campuses. 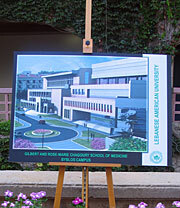 One of many stands that decorated the Byblos campus on the occasion of the medical school's groundbreaking ceremony that happened in July 2008. The development of physical resources on the Beirut campus is being done with an attention to "preserving the greenery," says Georges Hamouche, assistant vice president for Facilities Management. A view of the Byblos campus and the excavated area before the construction of the medical and nursing schools had begun. 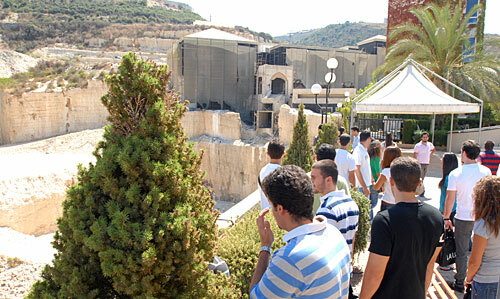 LAU medical students check out the construction site of the School of Medicine during orientation day in August. 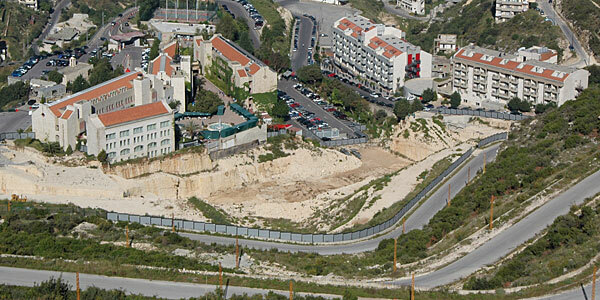 Plans for the construction of a new library on the Byblos campus are under way. The existing one is shown here. 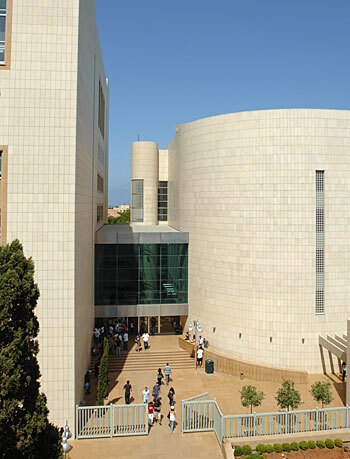 The latest major expansion on the Beirut campus has been the complex housing the School of Business and the Riyad Nassar Library (seen here). "There is plenty of room to expand in Beirut by building vertically, not horizontally," says Hamouche. Faculty, student and staff numbers at LAU continue to climb at an unprecedented rate. 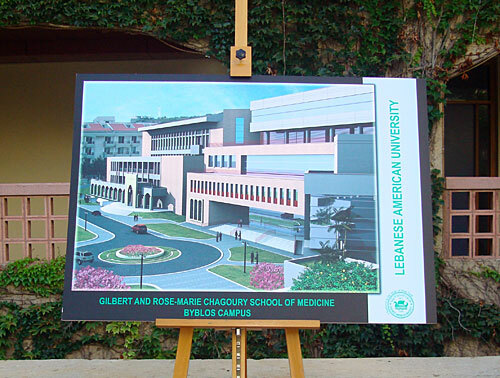 The two new schools that opened this year, the Gilbert and Rose-Marie Chagoury School of Medicine, and the School of Architecture and Design, with the School of Nursing on its way in fall 2010, have placed new demands on LAU’s physical resources. To keep up with the huge rate of expansion, the Facilities Management Department is developing and implementing master plans for both the Beirut and Byblos campuses to include renovations and constructions of new facilities and centers. “With the increasing number of student enrollment and growing staff, you need proper offices and facilities,” says Georges Hamouche, assistant vice president for Facilities Management. “There are major renovations planned for the next five years in Beirut,” Hamouche says while explaining the Beirut master plan is still in the works and is expected to be finalized around March 2010. The Beirut infrastructure project, still in its final stages of design, is perhaps the most notable among them. With plans to begin implementation in spring, the project includes an upgrade of LAU’s emergency powerhouse capacities and a complete renovation and upgrade of the main data center, which stores all university data. Within three years, Hamouche says his department also hopes to implement the space reallocation plan. The project will group together related departments, offices and academic units that are currently scattered throughout different buildings. The Beirut-campus power infrastructure will soon be upgraded too with additional generators and synchronized panels. Further down the road, Hamouche says plans will be drawn to excavate a plot of land recently purchased to construct a building with a potential area of 10,000 square meters, or about half of the current area of the Beirut campus. “There is plenty of room to expand in Beirut by building vertically, not horizontally,” Hamouche says. “Once the master plan is completed by March, LAU–Beirut will be a beautiful campus,” he adds. Several key projects form the core of the Byblos master plan, including the anticipated medical and nursing schools’ building, due for completion by fall 2011, the Gibran Khalil Gibran Library and the Frem Civic Center. The 5,240-square-meter Frem center, which has been under construction for the past 18 months, is expected to be finished and inaugurated by March 2010. The center will house offices, classrooms, labs, several LAU institutes, lecture halls and a state-of-the-art multi-purpose hall. Plans for the Gibran library are still being developed with no firm timeline for completion, although Hamouche says the library will likely be ready by 2015. 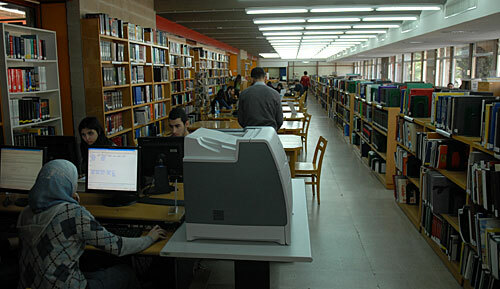 The new library is being designed to make greater use of virtual and electronic books reserves than the existing Byblos Library, and will accommodate an information commons, cybercafes and other features. Phase one construction of an underground parking garage for over 600 cars has begun in Byblos and will be completed in approximately one year, though no final date for its overall completion has been set. And while construction may not begin for years, the School of Engineering can look forward to a new building to centralize its operations by housing all the current engineering workshops and labs scattered across the campus. To support LAU’s fast-paced expansion in Byblos, a brand new infrastructure project in a valley next to the campus is under construction. It will include centralized power plants, a chilled water system, a wastewater treatment plant, and will provide utility lines, cables and drainage pipes throughout the campus through an underground tunnel system. “We are doing it in phases and planning it very carefully in order not to disturb campus life,” Hamouche says. 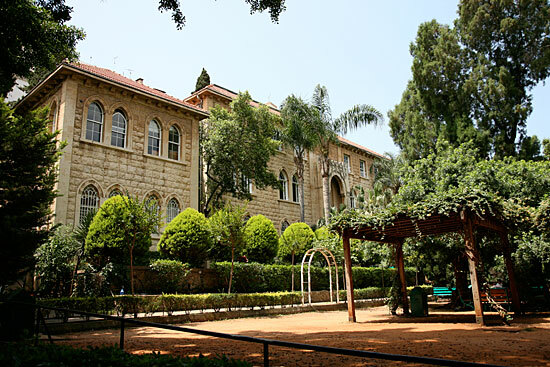 Learn more about the Beirut and Byblos campuses.